A significant, even historic thing happened on Saturday morning, Feb. 27, when Argentina’s new president, Mauricio Macri, visited Pope Francis in the Vatican. Few noticed it, however, because it regarded protocol. In the 20th century, Vatican protocol required that if a Catholic head of state visited the pope accompanied by a spouse not married to him (or her) in the church then that person was not admitted to the official audience with the pope. Instead, the pope would greet that person separately in another room after the main audience. 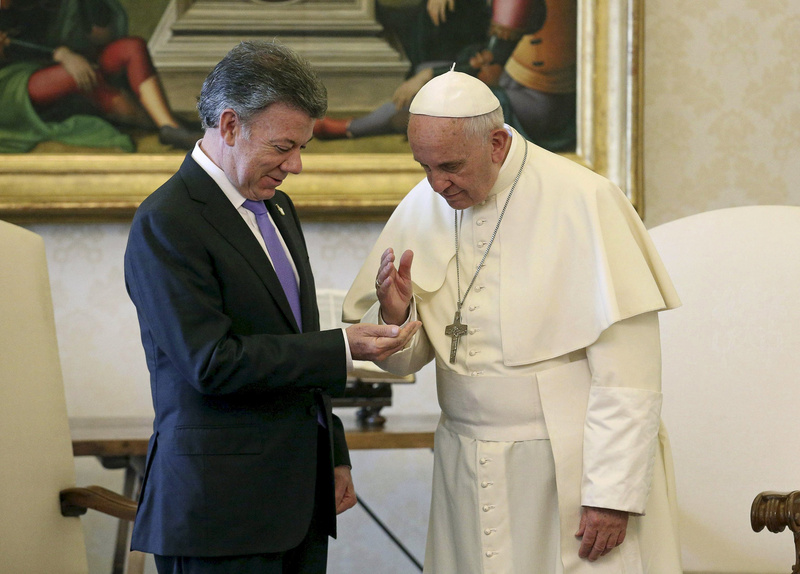 This is what happened on June 15, 2015, for example, when Colombia’s president, Juan Manuel Santos, came to visit the pope with his spouse, María Clemencia Rodríguez Munera. She married in the church in 1982 but soon divorced and had not received an annulment when she contracted her second marriage, with Santos, in a civil ceremony in 1987. The Vatican insisted that Santos’s wife could not join him for the audience with Francis, so the pope had to greet her afterward in a different room. Pope Francis felt deeply unhappy at this situation imposed on him by protocol. He felt an injustice had been done to the couple, a Vatican source told the Argentine daily La Nación. On more than one occasion since his election, Pope Francis has commented publicly, albeit in a humorous vein, that the difference between protocol officials and terrorists is that one can dialogue with the latter! After serious reflection, he decided to change the protocol. Thus, before Argentina’s new president visited him in the Vatican accompanied by his third wife, Juliana Awada, sources told La Nación that Francis, overcoming resistance from the protocol chiefs and secretariat of state, upended the protocol and ensured he could receive Macri with his wife in his private library. By now, it has become clear to everyone that Francis is a reforming pope, and his reform is not confined to the Roman Curia. It is moving in many directions. Two recent well-known examples illustrate this: first, his decision to open the Jubilee Year and Holy Door in Bangui and to allow holy doors to be opened in every diocese worldwide; and second, his decision to change the ceremony of the washing of feet on Holy Thursday so as to include women. In addition, in August 2013 he broke with protocol by bowing to Queen Raina of Jordan when, according to a centuries-old tradition, it should have been the other way round. Francis does not want an imperial court, or indeed any kind of court. The desire to include people rather than exclude them is one of Pope Francis' most endearing qualities. This article also appeared in print, under the headline "Breaking Protocol," in the March 21, 2016 issue. Gerard O’Connell is America’s Rome correspondent. America’s Vatican coverage is sponsored in part by the Jesuit communities of the United States. Twitter: @gerryrome.